Takeaway: A well-rounded fitness program includes an effective upper body workout to build strength and tone your arms, chest, and shoulders. Once you start building strength in your upper body, working out other parts of your body will become that much easier. Additionally, strength training can also keep your bones healthy. Try a 10, 5, or 3-minute arm workout to start building strength today! Did you know that arms tone up faster than any other muscle group in the body? There are plenty of arm workouts that deliver quick and visible results. While a strong core and toned backside is something we all aspire to have, they should only account for a small part of the body’s fitness equation. There are many benefits to working out your arms and upper body. According to the American Heart Association, performing strength training exercises for your upper body can boost your heart health. You don’t need to overload yourself with a ton of weight if you’re just starting out; a small but effective amount of resistance will do the trick. Frequently working out your upper body (yes, that includes your arms) can significantly improve your posture. Weight training upper body muscles can stop you from slouching. Building your upper body muscles also protects your back and prevents injury. Once you start building strength in your upper body, working out other parts of your body will become that much easier. Additionally, strength training can also keep your bones healthy. Experts say weight or resistance training can help rebuild some of the density in our bones that we lose as we age. 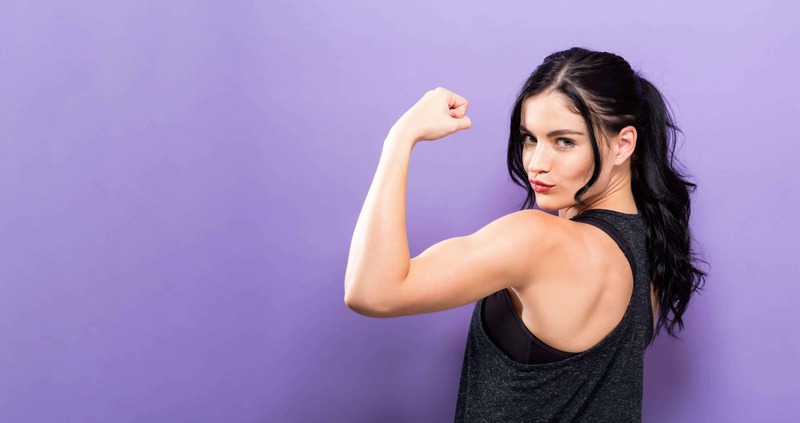 The best part about exercising your arms is that you can squeeze in a short yet effective arm workout routine without having to stress about your busy schedule. Some of the most effective arm workouts only take a few minutes a day. Kathy Smith, the creator of the Kathy Smith: Total Body Lift DVD, has created a great 10 minute arm day workout. This dumbbell arm workout also incorporates a stability ball for added intensity. Follow this step-by-step guide and go sleeveless in no time! Begin by sitting on the stability ball with knees bent 90-degrees, holding a dumbbell in each hand. Walk your feet forward until your upper back and your head are resting on the ball. Lift hips, and form a straight line. Extend your arms toward the ceiling, then bend your elbows to lower dumbbells behind you. Straighten your arms to complete one rep.
Do 15 reps and roll back up. Stand with your feet shoulder-width apart, holding two dumbbells in your right hand. Step back with your right leg, bending your knees slightly, and hinge forward from hips. Place your left hand on your left thigh. Extend your right arm below your shoulder. Bend your elbow to bring weights to ribs; extend. Do 12 rows. Switch sides; repeat. Holding a dumbbell in each hand, stand on your right leg, left leg lifted a few inches behind you. With your back flat and weights below your shoulders, lean forward from hips. Lift your arms directly out to your sides as you raise your left leg, and lean forward until body is almost parallel to the floor. Return to start. Do 12 reps; switch legs and repeat. 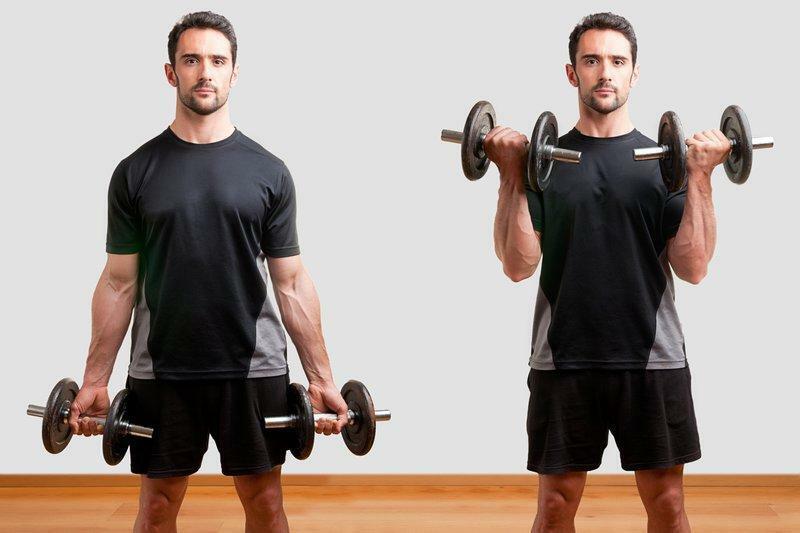 Holding a dumbbell in each hand, stand with your feet shoulder-width apart. Squat down, keeping your core tight. Bring weights together in front of chest, elbows out to sides. Bring your arms out to the sides of your body, and slowly return to center. Stand with your feet hip-width apart, knees slightly bent, holding a dumbbell in each hand, arms in front of thighs, palms forward. Lift your arms straight up to chest level in front of you. Without moving elbows, curl your right hand to right shoulder; extend. Repeat this same movement with your left arm. 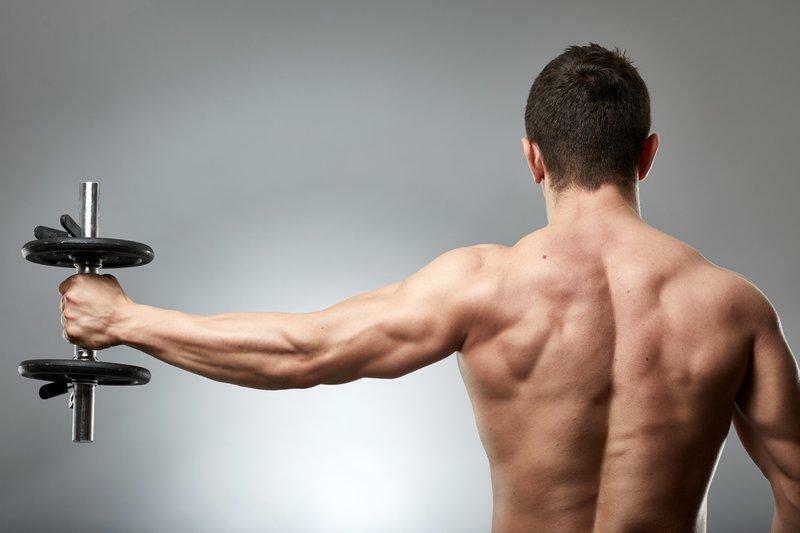 Do 20 curls, alternating sides. This five-minute Rockstar Arms Workout routine from Shape magazine is quick and effective. To complete this workout, you’ll need a set of dumbbells (3 to 15 pounds, depending on your personal preference) and a mat. Stand with your feet a little wider than shoulder-width apart, keeping your knees slightly bent. Hold the dumbbells over your head, with your arms in a football goal position. Your thumbs should be facing your ears. Keep your elbows aligned with your shoulders. Keeping your core tight, extend your arms straight overhead. Slowly lower your elbows back down, keeping them aligned with your shoulders as you bring them back down. Depending on your personal preference, you can hold both or just one of the dumbbells in front of your hips. Keeping your core engaged, bring your arms overhead and stopping when arms are slightly in front of your head. Bend your elbows and without bending your triceps back, lower weights behind your head all the way down to shoulders, as if you’re trying to touch your back. Keep your elbows close to your ears; don’t let them spread out to the side. Return to the starting position by flexing your triceps and aligning your arms back on top of your head. Stand with your feet a little wider than shoulder-width apart, holding dumbbells in front of your thighs, palms facing in. Bend elbows by your sides and curl weights up. Rotate so that your palms face the floor as you extend arms straight out in front of shoulders. Bend elbows back in by sides and lower to start. Begin in a split stance with your right foot forward, right knee bent and left leg straight, holding dumbbells. Keeping spine naturally straight, hinge forward from hips about 45-degrees, arms reaching down to the floor (palms should face thighs). Raise your arms to the sides of your shoulders, squeezing shoulder blades down and together during the movement (the ends of the weights should face up). Slowly lower your arms. Next, press arms back by your hips, with palms still facing up. Lower arms to complete one full rep.
Do 10 reps and then repeat on opposite side. 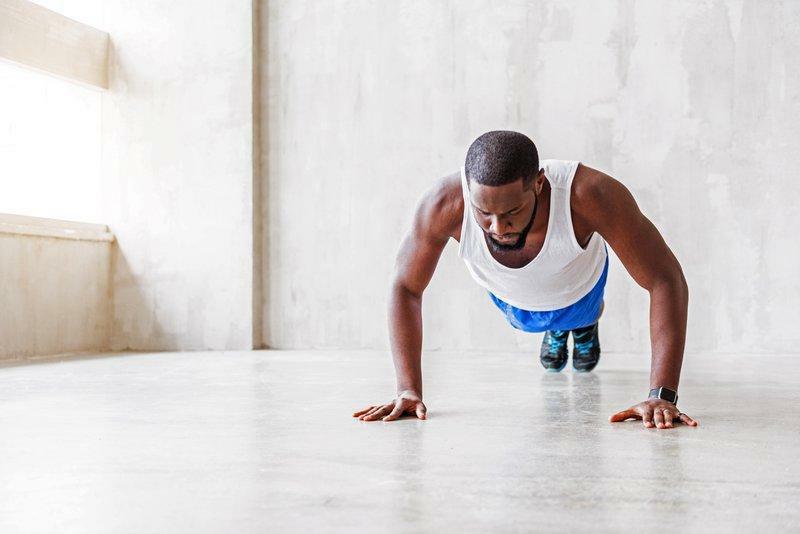 Start in a modified pushup position, with knees turned out to the sides, feet pressed together, and your hands shoulder-width apart. Keep your core tight and, keeping your spine naturally straight, bend your elbows in by your sides and lower torso to the floor, stopping a few inches above the ground. Try up to 20 reps in a row, resting when necessary to maintain proper form. The great thing about at-home arm workouts is that you can do them on your own time, without feeling self-conscious that others may be watching you. You also don’t have to pay for an expensive gym membership that you’ll only get around to using once or twice a month. At-home arm workouts are free, easy to follow, and highly effective. The best part? You can get a good and effective arm workout without weights. Below are some exercises to build and tone your arms at your own pace, from the comfort of your own home and without any equipment. Stand up straight, with your feet flat on the ground and arms extended out to your sides at a 90-degree angle (think of your body as a T). Start moving your arms in small, fast circles forward. Do as many rotations as you can and then reverse the motion, doing as many circles as you can in the opposite direction. Repeat this two more times. Once you’re down in plank position on the floor, keep your feet together with your toes pointed down and your hands shoulder-width apart. The entire length of your body should run parallel to the ground. Your hips and back should be flat. This alignment needs to be maintained as you bend your elbows and lower your body to within an inch or so of the floor. Push yourself back up to reverse this motion. Repeat for a total of 10-15 push-ups. 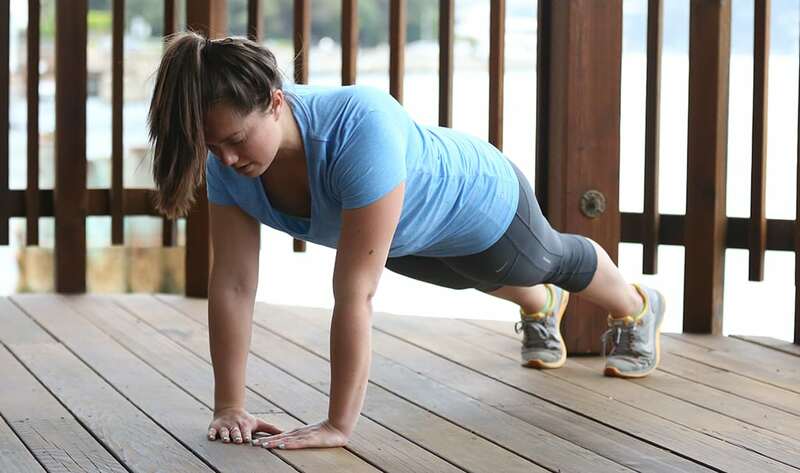 Like a push-up, you will need to position your body horizontal to the ground. Keep your forearms straight on the ground, your back straight, and your core tight. Keep your body in this position for a minimum of 30 seconds. Take a rest, get back into plank position, and do 2 more sets. For this pose, your body will form a reverse V-shape with your heels pressed down or close to the floor and your hands flat on the floor. You may need to bend your knees to keep your body in the reverse V-shape. Use your arms to push your weight back toward your heels and make sure you’re not rounding your back. Hold this pose for about 30-35 seconds. While sitting on a chair, grip the edge of the seat with your hands and stretch your legs out in front of you. Move your body forward so that your feet are flat, your arms are bent behind you holding you up, and your body is extended above the ground. Slowly raise and lower your body using your triceps. Keep your core tight to engage your abs. Do three sets of 15. For some added intensity, you are always welcome to incorporate weights into your arm workout routine. Adding weights can challenge you to build double the strength in your upper body and arms. 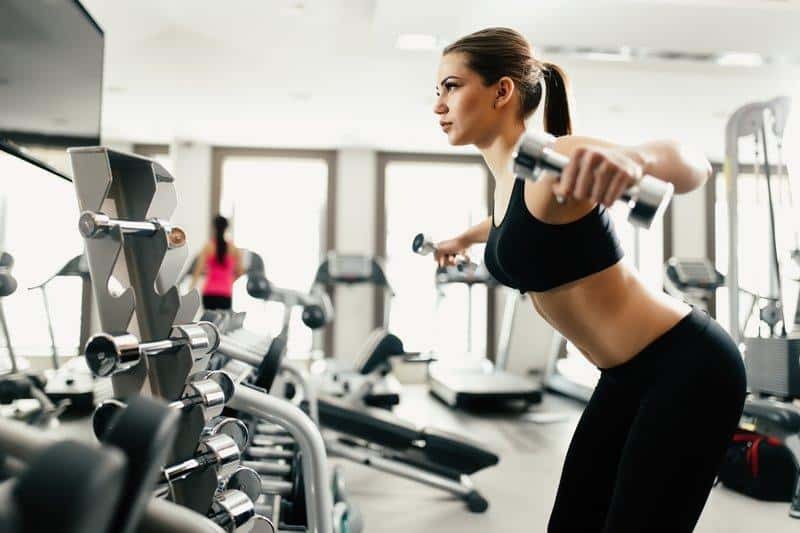 Weight training has also been proven to raise your metabolism for up to 24 hours after a workout, allowing you to burn more calories throughout the day. Below are a few workouts you can try that incorporate weight training and help enhance and build definition in your arms. Stand with your feet slightly wider than hip-width apart and hold a dumbbell in each hand. Hold your arms out wide with a slight bend in your elbows and palms facing up. Bend at your elbows, pulling the weights toward your ears. Extend your arms out wide again to complete one rep. Complete 10 reps with proper form. Lie with your back on the floor on your exercise mat, with your feet planted and knees bent. Holding a dumbbell in each hand, lift the weights straight up from your chest, wrists in line with your shoulders and palms facing outward. Bend your elbows 90-degrees as you bring your arms down to graze the floor. Then, press the weights back up overhead, engaging your core as you go. Lean forward and bend both your knees, remembering to keep a flat back. Extend your arms, so they are straight. Lift the dumbbells straight up to chest level, squeezing your shoulder blades together as you do. Be sure to keep your elbows in and pointed upward. Don’t arch your back. Slowly lower the weights back to the starting position to complete one rep. Stand with your feet hip distance apart, and place a dumbbell in each hand, palms should be facing your body. Keep your knees slightly bent, and your shoulders aligned with your pelvis. Keeping the dumbbells close to your body, raise them to your shoulders, bending your elbows out to the sides. Slowly lower them to the starting position. This is one rep.
A popular misconception that a lot of women have is that they will “bulk up” if they weight train. However, this is actually physically impossible, as women have 10 to 30 times less testosterone than men and have a much harder time gaining size from strength training. Instead, training your arms can help you develop muscle definition and strength in your upper body without increasing the size. You are actually doing more harm than good by skipping out on weight lifting at the gym. 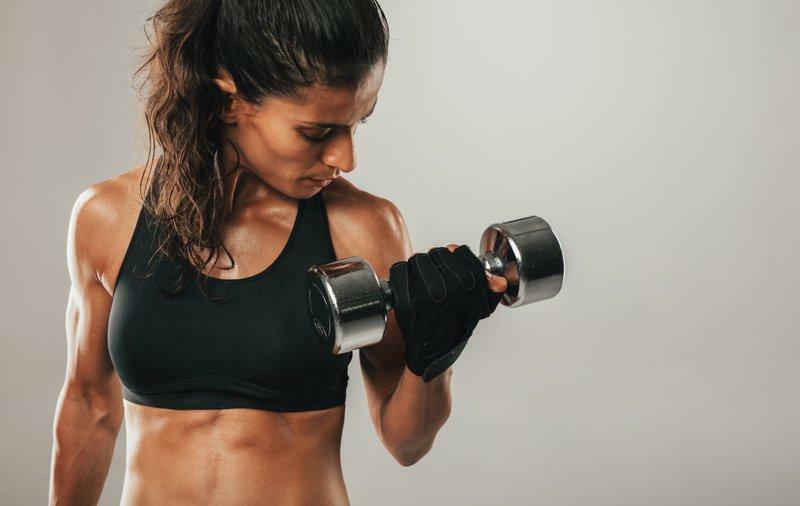 Learn to love arm day with this list of effective and easy to follow arm exercises for women. Hold a pair of dumbbells at arm’s length by your sides and kneel on the ground. Bracing your core and keeping your arms straight, raise the weights in front of you until they’re in line with your shoulders. Keeping your arms lifted, extend them out to the side. Then return to start. Do three sets of 10 reps. Stand with your knees bent and lean forward slightly, with a dumbbell in each hand. Bend both elbows to bring the dumbbells to your side, making your upper arm parallel with the floor. Press one dumbbell back, and as you straighten your arm, squeeze your triceps. Return to start. Repeat on the other side. That’s one rep.
Keep your feet close together. Hold a pair of dumbbells at your sides, palms facing you, and keep your back straight and chest up. Without moving your upper arms, bend your elbows and curl the weights toward your shoulders. Slowly lower the weights back to the starting position, straightening your arms completely. That’s one rep. Without moving your upper arms, bend your elbows and curl the weights until your arms form a 90-degree angle. Hold here for 30 seconds, then lower back down. That’s one set. 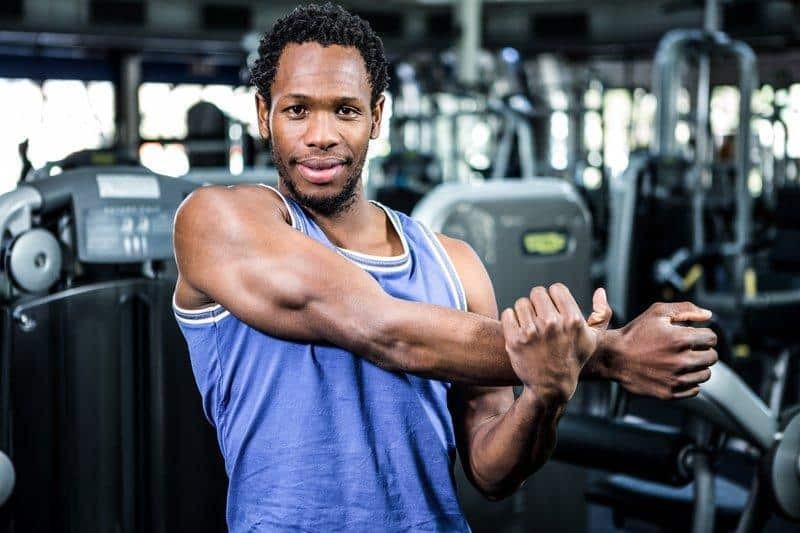 Arm muscles are very resilient and recover quickly meaning that they are better suited to handle repetition and high-intensity training than some of our other muscle groups. Train your arms with a variety of techniques to get the most out of your next arm workout routine. Below is a superset of the effective bicep and tricep arm workouts for men. Stand up straight, keep your core tight. Let the dumbbells hang by your sides, palms facing forward. Without moving your upper arms, bend your elbows and curl the dumbbells as close to your shoulders as you can. Pause for a second and slowly allow the weights to return to the starting position with arms fully extended. Do as many reps as you can in one minute without compromising your form. Lying on your back, bring a dumbbell directly over your chest and bend your arms to bring it closer to your head. Throughout the movement, aim to keep your upper arm perfectly perpendicular to the floor. Bend the arms just until your forearm is below parallel to the ground. By anchoring your shoulders down toward your hips and away from your ears, you will more fully engage your triceps. Do as many reps as you can in one minute, without compromising your form. 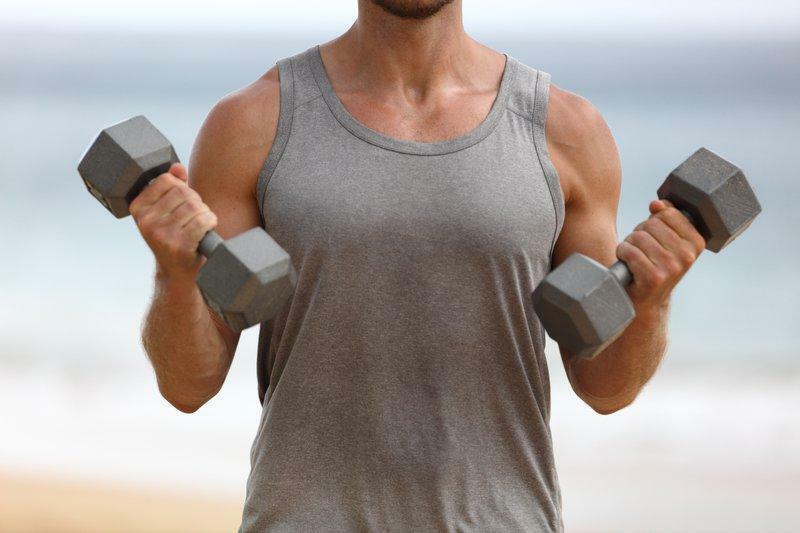 Stand straight up with your feet around shoulder width apart and a dumbbell on each hand. Raise the dumbbells to shoulder height on each side, and twist so that your palms are facing forward. Keep your head up and eyes facing forward. 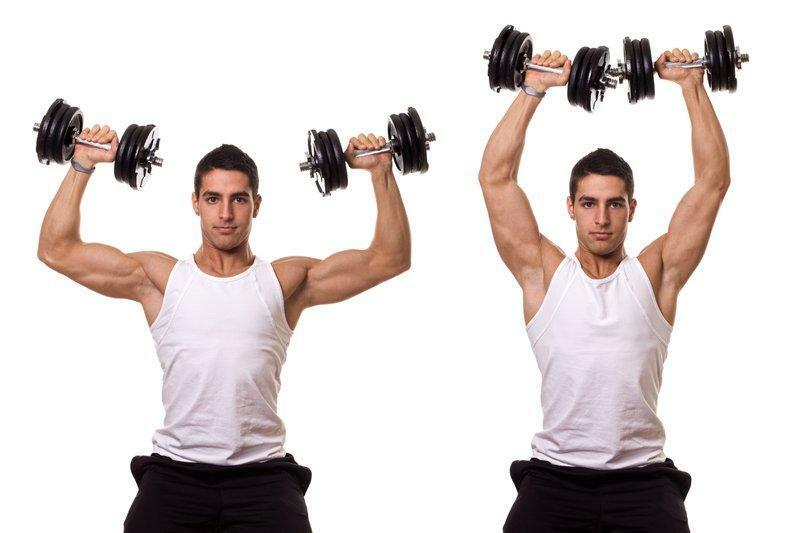 Slowly raise the dumbbells above your head until your arms are almost fully extended. Do not pause at the top of the movement, and immediately begin lowering the dumbbells back down to the starting position. Press your shoulders down toward your hips and away from your ears and lock them there before starting. Keep your elbows directly under each shoulder with very little displacement as you raise and lower the set of dumbbells. Unlike the standard curl, you’re going to rotate your hands from a palms-in position to a palms-up position. Pause at the top of the move and squeeze your biceps when the dumbbell is closest to the front of your shoulder. If you’re looking for a fast arm and shoulder workout, look no further! Bodybuilder Steve Cook has put together a short 10-minute video to help you get the most out of your next weight training session. Build a set of seriously strong shoulders and arms with this superset-based video workout. What Are Electrolytes, and Why Do We Need Them? What Is Muscle Tone, and Why Is It Important?